Quick caveat: nothing we write in PETITION ought to be construed as investment advice and we have all kinds of lawyerly things to say on this topic in our disclaimer here. Cool? Cool. Now that that boring disclaimer stuff is out of the way, if you've ever wondered whether you could ACTUALLY short retail - other than getting into restructuring - there is a new group of ETFs that do just that. Bloomberg and Axios both reported this week on the rise of ETFs targeting the retail industry, including, gulp, one's that use leverage to do so. It's our understanding that even firms with strict trading/conflicts policies allow for index fund investing. So, knock yourselves out. Again, note the disclaimer and if you lose money don't blame us. More Walmart. Apparently Walmart doesn't care one iota that it's driving grocer margins way down in a race to the bottom. This is going to get ugly. Case and point: Central Grocers looks like it is on the precipice (with Weil, Conway MacKenzie and Peter J. Soloman in the trenches). And as groceries get cheaper, it will get harder and harder for casual restaurants to compete as well. In previous newsletters we have discussed co-cooking kitchens and co-retailing spaces. Now there is also a co-warehousing solution expanding into seven major markets - including New York and LA. Darkstore, a new recipient of $1.4mm in seed funding (which, we recognize, ain't much), empowers brands to offer same-day delivery. The company leverages excess capacity in storage facilities, malls and bodegas and uses those spaces as fulfillment centers (which is an interesting concept considering all of the recent debate about vacant retail space, including in NYC, and the battle for the "final mile"). We have no idea how they'll make money given all of the different players in the mix but this is an interesting idea. Back in October, Garden Fresh Restaurants* filed for bankruptcy. 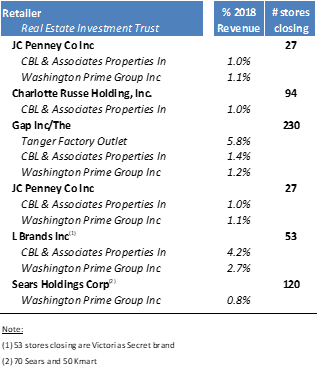 In January, The Limited Stores* filed and ultimately sold for a pittance to Sycamore Partners. Soon, if the rumors are true, Gordman's will file. What do all of these companies have in common? Sun Capital Partners. Gordman's would be the third Sun Capital portfolio company bankruptcy in five months - which doesn't really enhance the image of private equity firms now, does it? Thousands of jobs are now gone (a typical and increasingly earned PE trope), but Sun Capital has gotten its dividends and fed its LPs. Did Sun generate returns for its LPs? Looks that way. But we're not sure a track record of multiple liquidations is what Sun was hoping for. UPDATE: Shortly after publishing this, Gordmans Stores Inc. did, in fact, file for bankruptcy. You can find the case summary for it here.